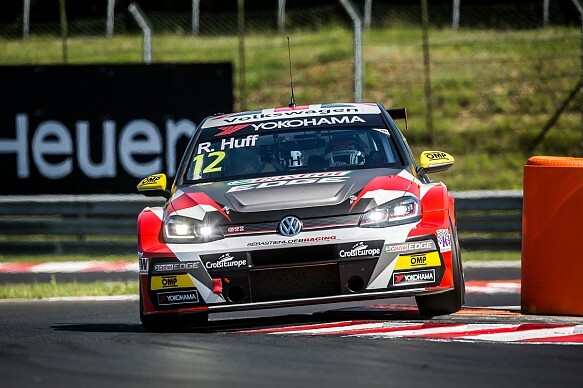 Rob Huff has been promoted to pole position for the reversed-grid World Touring Car Cup race at the Hungaroring after wildcard entrant Attila Tassi had his Q2 time deleted. Tassi, who is driving a KCMG Honda Civic and is one of two wildcard entries for the event, jumped up to ninth with the final lap of the second part of qualifying. That dropped Sebastien Loeb Racing Volkswagen driver Huff to 11th - handing second wildcard entrant Daniel Nagy (pictured below) reversed-grid pole, at the head of what would have been an all-Hungarian front row in Sunday's first race with Tassi alongside. But Tassi, who was the last driver to leave the pits ahead of the final Q2 runs, crossed the line 0.0075 seconds after the end of the session time had elapsed when starting his final flying lap. The teenager's lap was therefore deleted from the session results, moving Huff back up to 10th in the session classification and onto pole for the first race of the afternoon. Nagy, whose Q2 lap was a thousandth of a second faster than Huff's, will now start from second in his Hyundai i30 N alongside the Briton. Tassi later had all of his qualifying lap times cancelled for failing to stop at the weighbridge during the session and will start both races from 26th. Fabrizio Giovanardi will start from the back of the grid for the same offence, while Benjamin Lessennes was given a three-place grid penalty for Sunday afternoon's first race for going past a red light at the end of the pitlane after mistiming his departure ahead of his Q3 shootout lap. Lessennes, who qualified fifth in his Boutsen Ginion Honda Civic, will start the reversed-grid race from ninth.